COCOON WEBBING AGENT is a resin solution that is a reinforcing additive. COCOON WEBBING AGENT, when mixed with any Cocoon coating, is used to form a bridge over openings. A properly sprayed coat of COCOON WEBBING AGENT will result in a fine, dry, cobweb-like filament which will not break of its own weight. 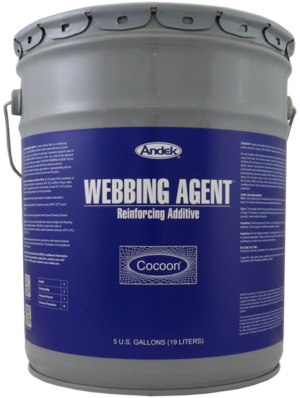 COCOON WEBBING AGENT forms part of the Cocoon range of products that have diverse uses for architectural and industrial coatings applications in waterproofing and air sealing. Cocoon has been in continual use for over 50 years. Produces fine filaments that will rapidly form a bridge over openings. Strong reinforcing and bridging abilities provide an alternative to fabric reinforcing. Cocoon Webbing will form bridges in both interior and exterior situations where it will support the membrane and protect against the penetration of water, dust, gas or air. Joints and bridges formed with the Cocoon Webbing and membrane will remain flexible and withstand thermal shock from rapid cycles of extremes of temperature. All surfaces must be dry, free of dirt, loose debris, oil, grease, or any substance that could interfere with adhesion. Additionally, all surfaces should be modified in a manner to make them as smooth as possible by removing sharp projections and filling gaps and voids. A minimum surface profile of ½mm should be maintained for maximum adhesion. After proper masking, prime the entire surface to be coated with COCOON VINYL BOND B, directly from the can, by spray or roller, and allow the primer to dry. When dry, the surface should be glossy and a light blue color. rapid pass to provide the webs some strength and prevent them from breaking when the Cocoon coating is applied. Proper ventilation must be provided during application for effective drying of the coating, and all applicators must wear suitable respirators. All webbing work must be protected from inclement weather during application. Application should cease upon commencement of precipitation and be thoroughly inspected prior to re-commencement and force-dried, if necessary, so as to prevent entrapment of water. If webs are damaged, re-webbing may commence provided that the surface is uncontaminated; otherwise, clean and remove all contaminated material and re-apply. Read and understand the Material Safety Data Sheet thoroughly. Make sure that all involved parties are familiar with the M.S.D.S. Cocoon Webbing Agent, in its liquid state, is flammable, and proper safety precautions against exposure to open flame, sparks, or other sources of ignition must be taken and strict safety rules enforced.